All The Pretty Dresses: 1770's Robe a la Francaise or early 20th Century Costume? 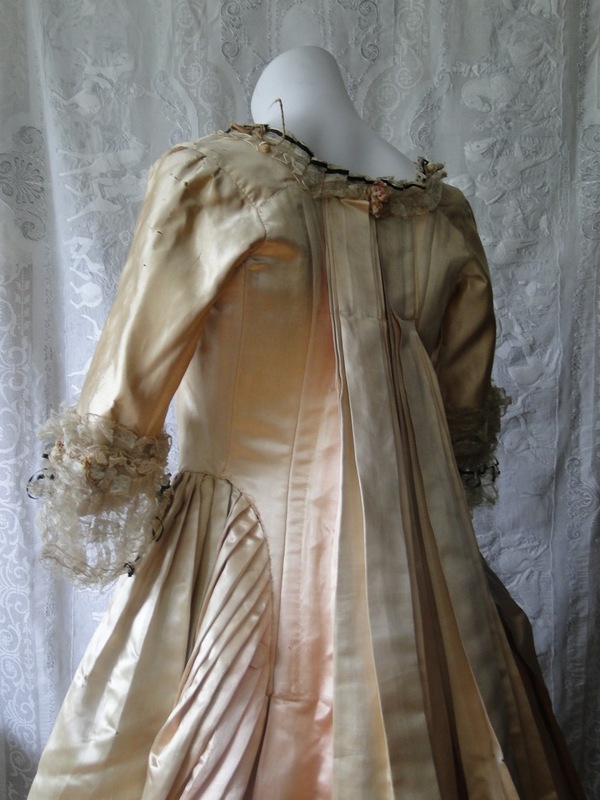 1770's Robe a la Francaise or early 20th Century Costume? 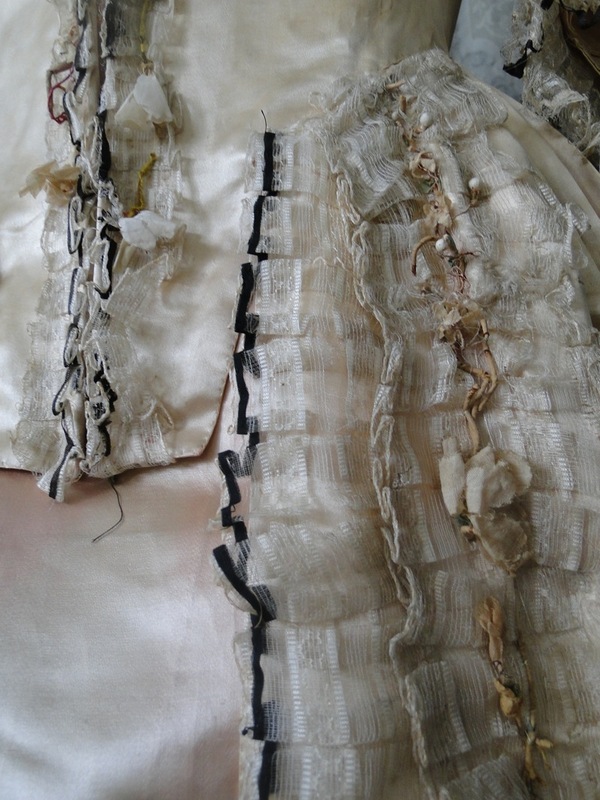 Circa 1774, a pink satin open robe with inside corset with back lacing with a open skirt and petticoat with a trim of lace furbelows and pretty cloth flowers.There is some fading of silk, and some large splits throughout the ensemble.This needs work from a knowledgeable costume restorer as it is quite beautiful or for display or study . Alright everyone, get out your Janet Arnold's Patterns of Fashion Volume 1. Turn to page 37. 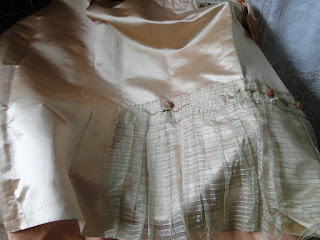 See the squared pointed front waistlines just like on this dress? Okay...that's not where I see a problem with the dating. 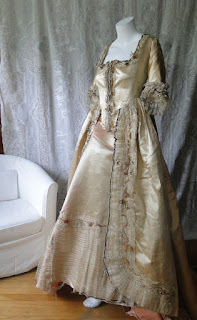 ...The problem I see is with the lace. 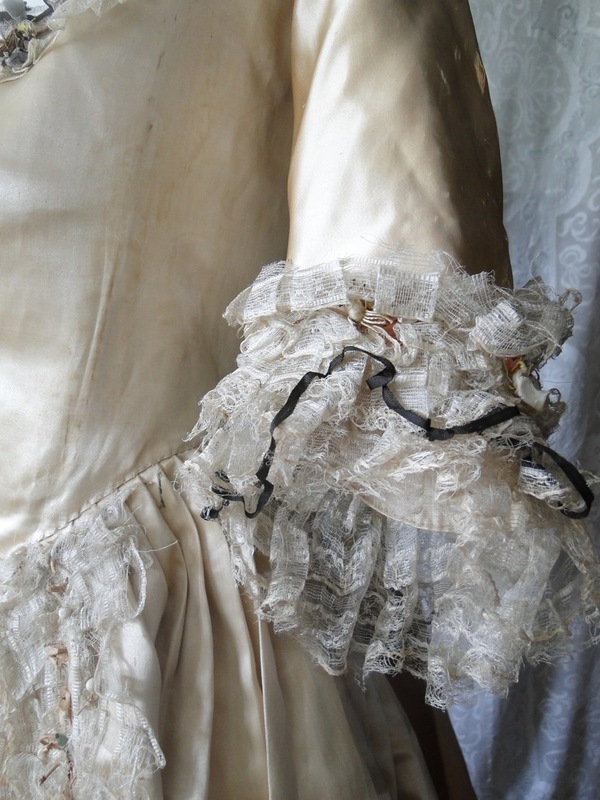 The lace just looks late 19th/early 20th C to my eye. 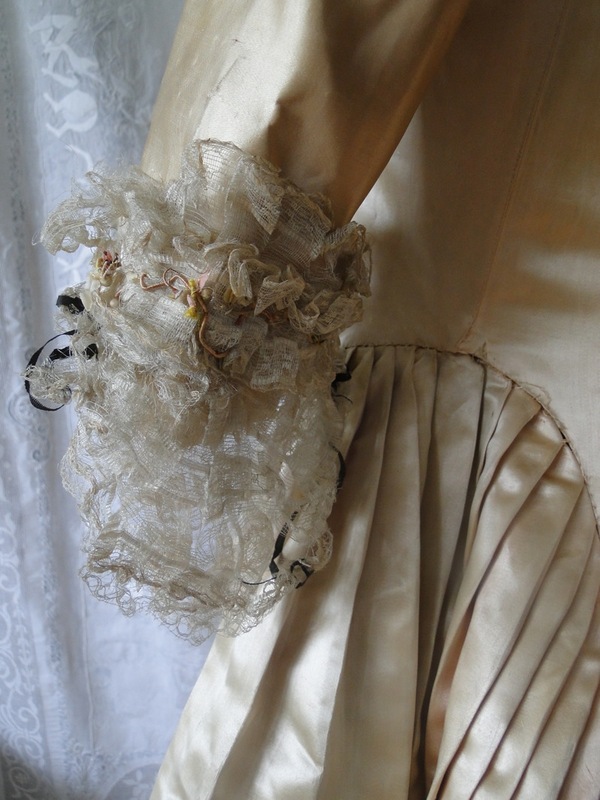 The floral decorations and even the velvet edging - all very early 20th century looking to me. 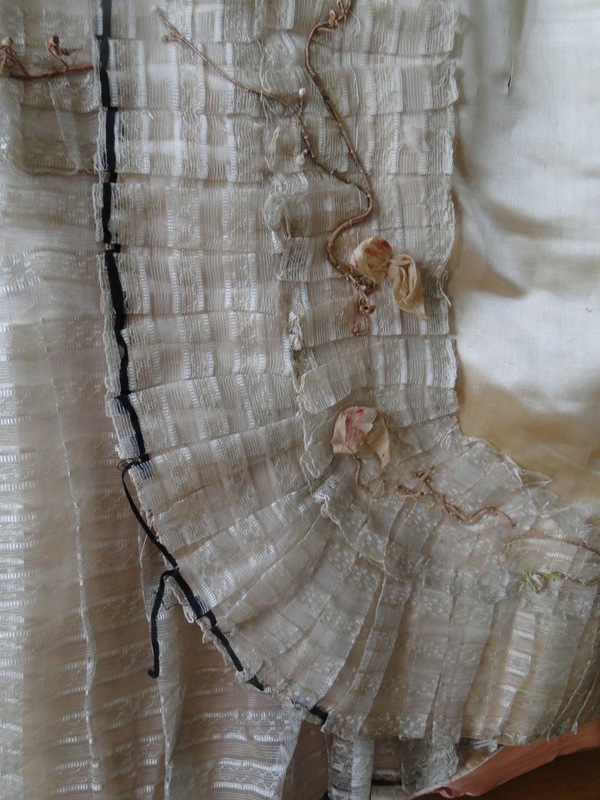 But the dress clearly has hand sewn details. So....maybe? There are a couple of possibilities - it is 18th century and it's fine. Just I've never seen lace edged in velvet with floral decorations on it before. 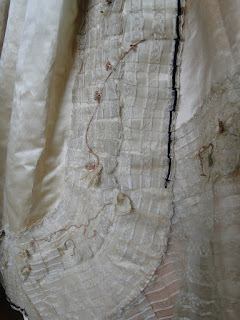 Typically, when the lace is edged (or any big 18th century trim) it's edges on both sides - not one. They were all about balance within the chaos. In the 20th century...not so much. 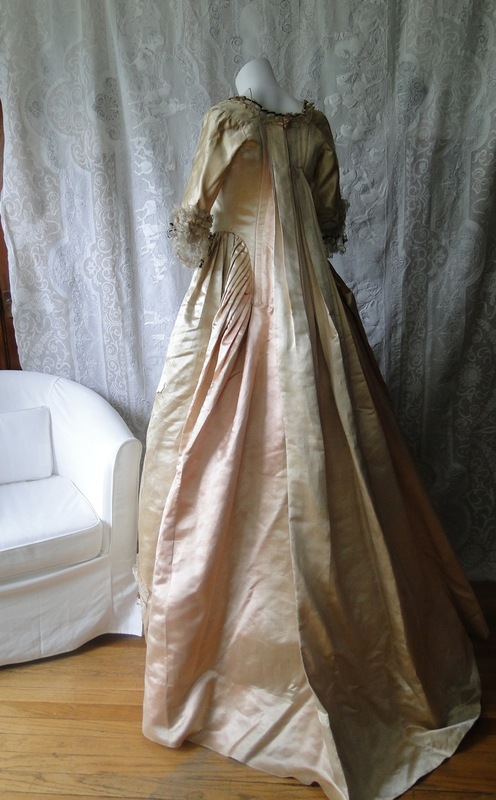 Now, in the beginning of the 20th Century, having a well done costume like this makes sense for a big budget movie - like Catherine the Great (1930's) or the Scarlet Pimpernel or Marie Antoinette or any of the many other movies made in the 1930's or earlier about the 18th century. The shattering of the silk almost makes sense with the early 20th century - 18th century fabric tends to have "worn" holes or ripped - not shattered. It's not a hard and fast rule but it being ripped is more common that the splitting we see with this one. The lace would make perfect sense then - it looks like deadstock insertion lace to me. I really wish we had some inside photos of this one because that would help as well. What we can see are those big hooks and eyes - which also bother me from the 18th century perspective. 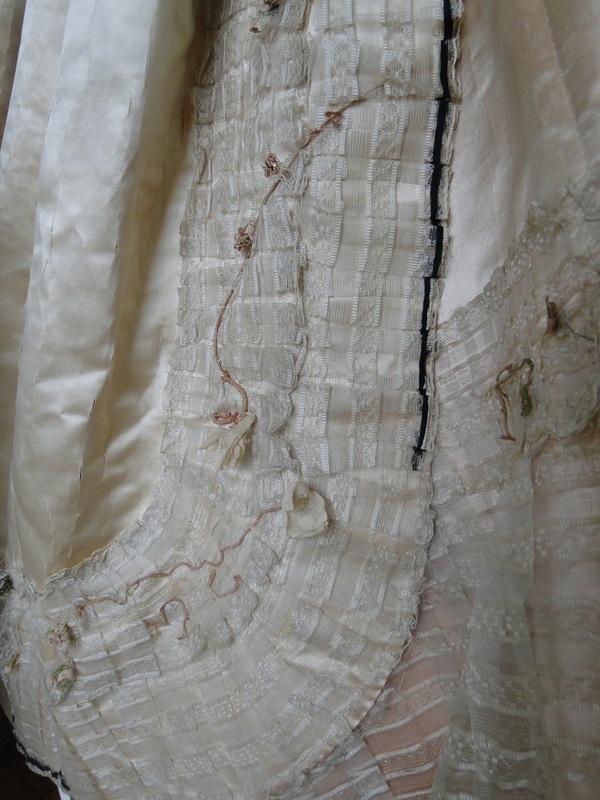 They absolutely had hooks and eyes as a closure option in the 18th century (I know you can date them back as a closure option to at least the early 15th century) but these are too...big. They look more like what you see in the later half of the 19th century as skirt hooks and in the early 20th century as hooks for heavy use. It just doesn't look quite right to me. So, any thoughts one way or the other? 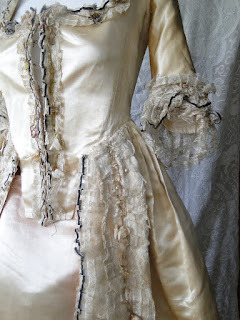 The lace looks wrong to me, too, but I'm no expert. All of my experience with eighteenth century dress has been in photos, not in person. I've seen this dress floating around ebay for a while. 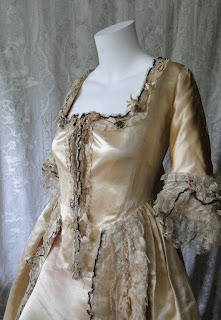 My theory is that it's either an original 1770s dress that was made over for a costume party at some point, or it's a stage or screen costume. There's just so much that's off about it, and I SWEAR there are princess seams on the bodice. There's also something off about where the pleated back attaches to the gown at the side back. It just...doesn't look right. It was hidden at the bottom of the listing. Thank you! I've added it to the post as well as a couple of others. I think you might be right - it's an original that was remade for a costume party at some point. 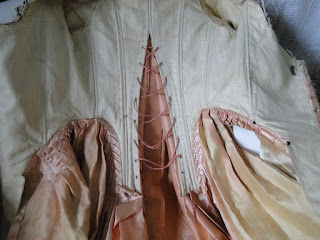 I bet the lace and trims were added on later and this was a simple pink silk dress - or the original trims were taken off at some point and these were put on. 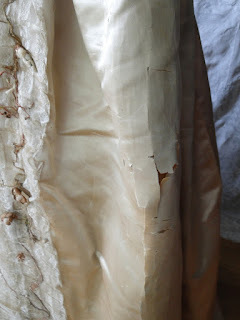 The insides do look hand sewn but there was clearly another trim on the skirt ( you can still see where the threads were in one of the "new" photos) which might make sense with an old dress being reused. The old trim might have been too frail or damaged.